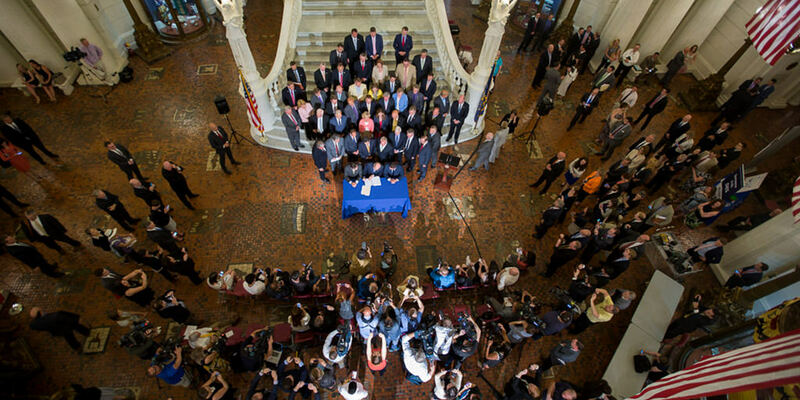 Harrisburg, PA – Today with a full house in the Capitol Rotunda as a backdrop, Governor Tom Wolf joined bipartisan leaders and members of the General Assembly to sign Senate Bill 1, the pension reform compromise bill. “Today is yet another demonstration that by working across party lines and branches of government, we can address important issues,” Governor Wolf said. “Working together, we legalized medical marijuana, continue to combat the opioid and heroin abuse epidemic, passed a liquor reform package, and invested in our schools in a fair and equitable way. Governor Wolf recognized members of the General Assembly he said were instrumental in passing this legislation. Senators Corman, Scarnati, Brown, Costa; Representatives Turzai, Reed, Dermody; and others were on hand for the bill signing.